First: Visit a pamphlet kiosk when you arrive. You may find a discount coupon for an experience that turns your vacation into the trip of a lifetime. Look for coupons for gear, such as snorkel, here. Also, check out the island map you receive from your airline. Ours included a coupon for a free dessert at a waterfront resort. Staying in a condo, or lodging with a kitchen, makes a trip to one of the island's farmers markets a must. Markets are found in both Hilo and Kailua/Kona. (check on days and times they're open) Both markets offer much more than produce, although the produce is spectacular in selection and price. If avocados are in season--- ohhhh, enjoy! Be sure to pick up a bouquet of tropical flowers for your dining table, too. You don't have to stay at Waikoloa Village to visit the grounds. This beautiful Hilton Resort offers great dining, sightseeing, boat and tram rides. You'll see tropical birds and sea animals throughout the resort. Don't miss the Museum Walkway. For anyone who enjoys a great cup of coffee, The Big Island is home to Kona coffee. Just a few minutes south of Kailua/Kona lies a narrow hillside of coffee plantations. For a free tour and tasting, visit Holualoa Kona Coffee Company. Rain or shine, this is a truly interesting stop. The island of Hawai'i is an historical treasure. 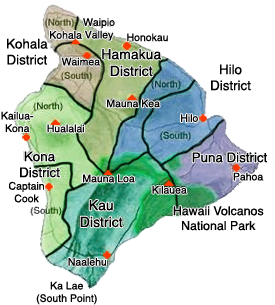 An interesting area to see "old Hawai'i' is North Kohala. Take a hike through an ancient fishing village (Lapakahi State Historical Park) or through the ironwood forest in Pololu Valley. Visit the 130+ yr. old King Kamehameha statue. If you are near the Hamakua Coast, visit the Hawai'ian Vanilla Company. Try their signature lemonade or their vanilla coffee. This is a vanilla-lovers paradise. The Parker Ranch in Waimea will bring out the cowboy in everyone. There are several tours available. One of the more affordable is a walk through the two historic homes and gardens of ranch founder, John Palmer Parker. The Ranch Store has some giddy-up-cute western duds for little buckaroos. How many products can you name that contain mac nuts? A visit to Mauna Loa Macadamia Nut Factory & Visitor's Center in Hilo is always fun, yummy---- and informative. Take advantage of "happy hour" at one of the many upscale ocean-side bars. For a reduced price, enjoy a drink, a snack, and some great people watching. Be adventurous. Stop along roadsides. You might see wild orchids blooming among cattle, or guava trees dripping with ripe fruit. A visit to a beach may afford views of whales. Look for local surfers at the less populated parks. Pack a lunch to be enjoyed at one of the many picnic areas. If you are in a convertible, pull over after dark to enjoy the night sky. Look for the constellation, The Southern Cross.